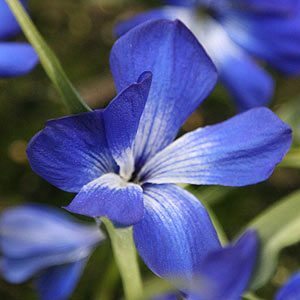 Blue flowering plants are fascinating and one of the best is Tecophilaea Cyanocrocus var. violacea or ‘Chilean Blue Crocus’, a beautiful blue crocus-like bulb that flowers in late winter. A native to the Andes mountains, it is almost extinct in the natural environment this a bulb that that has grown by gardeners since its discovery and so is available from selected nurseries. Requiring a dry cold winter to grow well, container growing is the preferred option of cultivation. The Chilean Blue Crocus is not really a crocus, but looks like one, the flowers are scented and really are a fantastic electric or gentian blue, large to 5 cm across with a splash of white in the throat for contrast. Although some variation in color is common this is a single species, T. cyanocrocus var leichtlinii with its paler blue flowers and T. cyanocrocus var. violacea are the two most common named variations. We suggest growing in containers, these wonderful blue flowing beauties do need cool conditions and they do like good drainage. A free draining potting mix is essential. Plant 5cm deep and do not over water. Liquid seaweed fertilizers applied at the beginning of the growing season seems to work for us. Mail or phone order plants & bulbs. Large range of rare and unusual bulbs and plants.Includes: Tecophilaea Cyanocrocus, Daffodils, Fritillaria, Trillium, Erythronium, Dicentra, Liliums, and many more.